2015 Indian Chieftain Indian Red, Come check out the new Indian Motorcycles and get the Best Customer Experience and Unbeatable Prices! Call us today 770-752-9160! 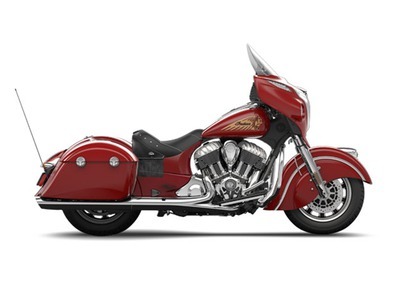 2015 Indian® Chieftain Indian Red NEW LOOK. SAME SOUL. The 2015 Indian® Chieftain is in touch with its past, but far ahead of its time. It s the first Indian Motorcycle® ever with a hard fairing, hard saddlebags and unprecedented new comfort and convenience features. It s like no Indian Motorcycle® ever seen before, yet its style makes clear it has the DNA of a legendary Indian Motorcycle®. Features May Include: Thunder Stroke® 111 The Thunder Stroke® 111 engine delivers an incredible 119 ft-lbs of torque and features styling that pays tribute to legendary Indian Motorcycle® engines of the past. Hard Saddlebags Spacious hard saddlebags are mounted on quick-release anchors and feature remote electronic locks you control with a console mounted button - or a convenient key fob. Windshield Raise and lower the power-adjustable windshield with the push of a button to customize airflow and protection. High-Output Audio The fairing houses an audio system that delivers clean, quality sound from dual high-output speakers. The aerodynamic fairing blocks wind to allow you to enjoy your highway playlist without interference. Driving Lights Driving lights provide both style and protection down any road you choose to take. Audio Bluetooth The integrated Bluetooth® smart phone connection makes it easy to run music stored in the phone through the Indian® Chieftain® audio system. Playlist info is displayed on the multi-function display screen, and switches near the handgrip make it easy to control the audio. Bluetooth® is a registered trademark of Bluetooth Sig, Inc. Keyless Ignition Enjoy convenient and secure keyless starting. With the Indian® Chieftain® key fob in your pocket, climb on the bike, push a button and ride. If you misplace the fob, use the individual security code that you pre-programmed into the ignition. True Dual Exhaust The engine produces a rich exhaust note from the true dual exhaust. The exhaust was acoustically engineered to eliminate high-pitched sounds, so what you really hear is Indian Motorcycle® thunder. All Indian pictures are kind of Indian HD motorcycles picture was taken, including motor fuel gauge, engine, engine mounts, tires, fuel tank, the car handles, lights and so on, 2015 Indian Chieftain Indian Red full-screen viewing,2015 Indian Motorcycles today Price: $21,799 .